t may not easy to imagine what the Jade Butterfly Necklace looks like when it’s worn. This is because designed to elegantly fit around your neck like a piece of sculptured fine art. You can see six green jade butterflies interspersed between the hand crafted bodies of five golden ones. 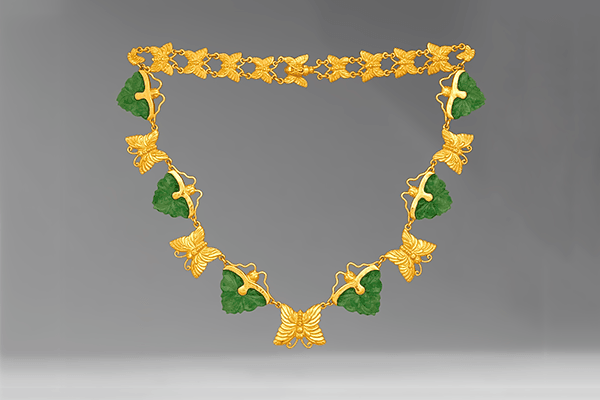 The jade butterflies in this necklace were carved out of grade A, natural Burmese Jadeite. 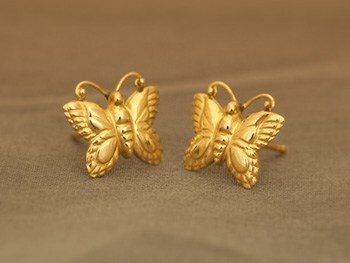 And the golden butterflies were made out of 22 karat gold using the fine art of repoussé jewelry crafting. It took 487 hours to complete the Jade Butterfly Necklace in the Zoein Jewels workshop. As you’ll find with many of the art jewelry in the Zoein collection, the Jade Butterfly Necklace adds the perfect touch to a classy outfit, or it could also easily be worn like a stylish accessory, with a button shirt and jeans. I did make a matching set of butterfly earrings that are pictured to the right. The earrings were not designed to draw attention away from the necklace, because that would be a crime. They’re only meant to add a extra bit a of pizzaz. The beauty and mystery of butterflies have long charmed the mind of man. They are rich metaphors and analogies that touch on some of the deepest and most profound mysteries. Did you know that butterflies are a symbol of life after death, of metamorphosis and transfiguration? This is natural because can witness first hand the miracle of a lowly life form, the caterpillar, transform into the awesome beauty of a butterfly. Like an Egyptian Pharaoh the mature caterpillar constructs its tomb, a stunning chrysalis. It then imitates death. Resting in a silken pupa sarcophagi the caterpillar awaits rebirth into a higher form of life. Some butterflies get intoxicated on the heady brew of fermented fruit and at times are too drunk to fly. Besides wine, merry play and pollination the main role of a butterfly during its brief but illustrious life, is sexual reproduction. What a life!!! This art jewelry set is deeply imbued with the natural significance of the auspicious Butterfly. As the Jade Butterfly Necklace gracefully adorns you enhancing your beauty and charisma, may the lightness of spirit, the freedom from concern and transfiguration that characterize the butterfly be brought to the forefront of your life.